Whether you are a native of South Africa, or you are simply visiting, you should certainly consider adding paragliding to your Cape Town agenda. If you are not interested in sticking with the typical tourist activities, this airborne sport is waiting to make your visit to Cape Town much more memorable. Imagine going for a beautiful hike through Cape Town. You reach the peak of a hill and enjoy incredible views. Instead of turning around and walking back down the hill, you could paraglide out over the landscape, taking in the breathtaking scenery from the best possible perspective. In Cape Town, it is common for pilots to choose paragliding from Lions Head or paragliding from Signal Hill. These two locations provide excellent elevations for launching, as well as spacious promenades nearby, allowing for gentle and safe landings. As you likely know, when you paraglide, you are gliding through the air. More accurately, you are attempting to stay in the air for as long as possible. As warm air rises, you want to be able to find these thermal pockets to give the glider a boost upward and to extend the flight. 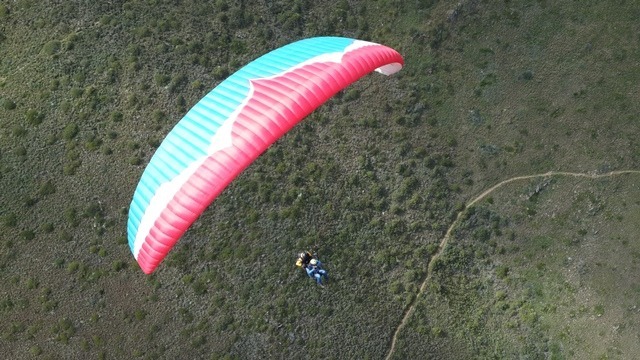 In this respect, the climate and geography of South Africa often makes for great conditions for paragliding in Cape Town. Much of the interior of the country consists of expansive, flat land, where warm temperatures are the norm. As you paraglide along the coast, there are still opportunities to benefit from pockets of warm air, while you also have the enjoyment of amazing coastal views. Depending upon the conditions, a paragliding session in Cape Town may only last 5 or 10 minutes before the glider descends to a landing. Or, thermal pockets may keep the structure floating for upwards of half an hour before it begins to float to the ground. You might be thinking that paragliding Signal Hill or Lions Head is simply not in the cards for your Cape Town adventure because you certainly are not a paragliding pilot. If you have just a couple of weeks available, you could complete paragliding training courses and possibly be ready to paraglide on your own. If you do not have the time or the interest to learn how to become a pilot yourself, this does not mean that you cannot enjoy the experience of floating through the air. An alternative solution is to schedule a paragliding session with a paragliding instructor who can show you the ropes. During your flight, the pilot is seated in a harness behind yours, controlling the structures speed and direction and attempting to catch thermal pockets. If you decide to go paragliding in Cape Town with the help of an instructor, be sure to check the experience of your pilot. You will be in good hands if you find a pilot who has helped numerous people enjoy the best paragliding Cape Town, South Africa has to offer.